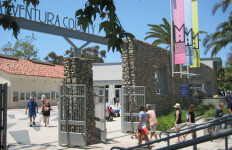 Unique indoor/outdoor venues located in the heart of the historic beach town of Ventura, across from the San Buenaventura Mission. Enjoy beaches, shopping, galleries, fine restaurants and hotels all within leisurely blocks, making the Pavilion and Plaza the perfect setting to create a truly memorable experience. Adjacent to the Pavilion is the Museum Plaza featuring mature palms, a beautiful water feature and gorgeous mosaics depicting the history of Ventura County. The Plaza is capable of holding an event tent and can seat an additional 140 guests. The Pavilion and the Plaza may be rented together or separately. Adjacent guest parking is available.